More to the point, Facebook has multiple ways of harvesting data from non-FB sources so the ostensible 'protections' are limited and, arguably, fraudulent. If you're not paying for the product, then you are the product. That business-world adage has allowed Facebook to thrive, attracting 2 billion users who choose to trade their personal information for no-cost access to the world's largest social network. The data they fork over have proven to be a treasure trove for Facebook, which relies on the information to sell ads targeted to specific swaths of users. But after years of exchanging their privacy for a free feed of news, ads, family photos and cat videos, some people are questioning whether they're actually getting a good deal. With Facebook under fire for its mishandling of user data in the wake of the Cambridge Analytica scandal, the social network is being pressed by some to consider a different business model — one that charges users instead of advertisers and, in turn, is not fueled by personal information.Facebook appears to be giving it some thought. When asked about the possibility of a paid service during Senate testimony this week, Facebook Chief Executive Mark Zuckerberg said his company would "certainly consider ideas like that." It's a proposal that is winning favor among technologists. Apple co-founder Steve Wozniak recently told USA Today that he'd rather pay for Facebook than have his personal information exploited for advertising. "Users provide every detail of their life to Facebook and ... Facebook makes a lot of advertising money off this," Wozniak said. "The profits are all based on the user's info, but the users get none of the profits back." 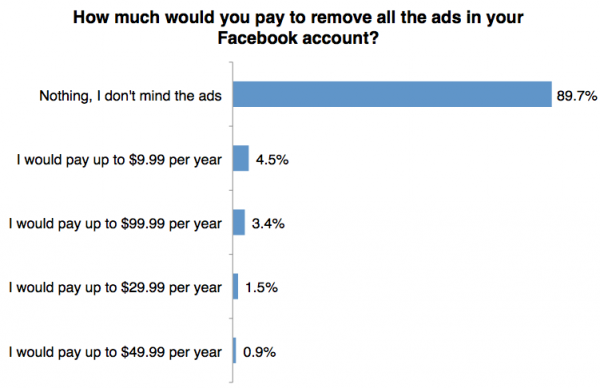 A recent survey conducted by Recode and market research firm Toluna found that 23% of respondents said they'd be willing to pay to use a version of Facebook that had no ads. 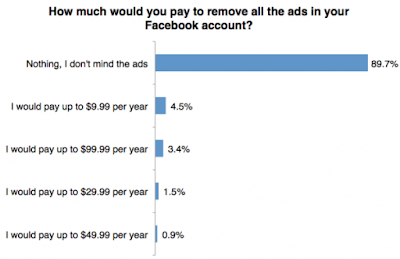 Of those respondents, 41.6% said they'd be willing to pay between $1 to $5 per month. The remainder said they would be willing to pay more. Subscription companies were once an anomaly on the internet, where the prevailing wisdom was that information trended toward free. But in recent years, successful online companies that built their empires on free content supported by advertising have also been exploring pay models. The general strategy has been to charge for special features, so users feel like they're getting something extra for their money. YouTube is available for free, but those who pay can lose the ads and get exclusive content. Spotify lets people listen to music for free, but the paid version cuts out ads and gives them more control over how they listen to music. LinkedIn, the social network for job-seekers, lets paying users see who has viewed their profile. Though consumers have been willing to subscribe to some online services, social media experts say when it comes to firms like Facebook — which has been free since its launch and whose ads can easily be scrolled past — a pay model is unlikely to catch on. That's because the core function of Facebook — connecting people — is something that can be done elsewhere without having to pay. The social network could tack on extra features, but social media experts are unsure what features would compel a user fork over cash. And researchers remain unconvinced that many people would opt to pay simply for their privacy — even as they pay lip service to it. "The whole fantasy that people care about privacy or they're desperate to get out of ad-supported networks is ridiculous," said Clay Shirky, a researcher on the social and economic effects of internet technologies at New York University. Simply put, the majority of social media users either don't really understand — or don't care — how their information is collected and used, said Ryan Detert, chief executive of Influential, a Los Angeles start-up that uses artificial intelligence to match advertisers with social media influencers. "The biggest growing segment for these social media platforms is the youth, and they grew up with this, so they know all their data is being collected, and they know they don't have privacy," said Detert. "I'm on the older side of Millennial and even I don't particularly care whether someone has my data. If you're Gen-Z, you really don't care." There can often be a disconnect between the behaviors consumers aspire toward — say taking extra steps to protect their privacy — and what they actually do. "I've been covering consumer attitudes and behaviors for a long time, and I don't see consumers changing their behavior very often," said Fatemeh Khatibloo, an analyst at Forrester Research. "They might take a few steps here and there, they might go through and change some permissions, but we're talking about 2 billion users. You're not going to make a dent in that." Zuckerberg made it clear in his Capitol Hill testimony that "there will always be a version of Facebook that is free." That means if Facebook were to establish a subscription service, there would be a two-tiered system where some pay for privacy and others pay with their data. That structure could on the one hand end up disadvantaging less affluent users while simultaneously allowing wealthier consumers — the ones advertisers might be most eager to court — to bypass ads altogether. Then there are the technical challenges. If a user who pays not to be tracked interacts with a user on the free platform, the subscriber's data would likely be swept up too, Khatibloo said. And could Facebook guarantee that it wasn't tracking paying users on other parts of the internet? Perhaps the main reason social media companies haven't tried pay models is because the ad-supported business has made them behemoths. "Why is the advertising-based system so dominant? Because it works for the companies, it works for the advertisers and it works for consumers," said Dan Jaffe, executive vice president of policy for the Association of National Advertisers. Facebook's critics have long said the company's harvesting of personal information makes it a singular danger to digital privacy. But that is precisely why Facebook is one of the most valuable companies in the world. That means any movement away from a data-driven business could undermine its success. "[Facebook] is sitting on one of the richest, most longitudinal, quantitative data sets we've ever seen," said Khatibloo. "They're not going to give that up easily."